Before Democrats reclaimed the state Senate last year, Governor Andrew Cuomo spent years triangulating with the Democratic-controlled Assembly, two factions of Senate Democrats, and the Republican Senate majority. The arrangement allowed him a heavy hand over the legislative and budget agendas in Albany and gave him the ability to claim credit and deflect blame as he saw fit (though critics didn’t always buy his explanations). Progressive legislation regularly withered on the vine unless it had Cuomo’s imprimatur, usually accompanied by some form of mutually beneficial compromise with rogue Democrats and Republicans. If this year’s budget negotiations have proved anything it’s that old habits die hard and Cuomo is unwilling to ease his stranglehold on state government, even when dealing with members of his own party. He’s continued to strongly, and perhaps shrewdly, set the foundation for negotiations. 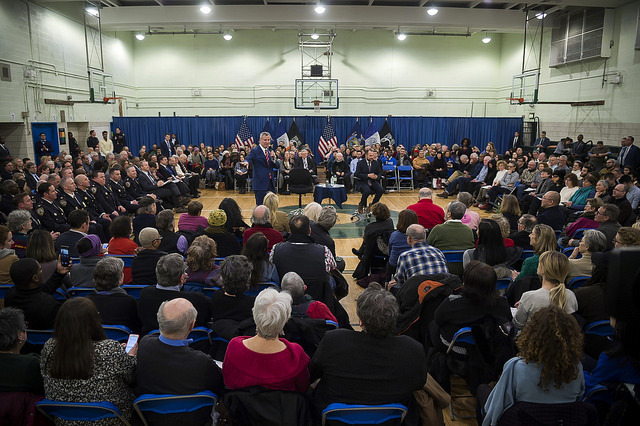 But some of the policies he has prioritized have long been wedge issues between lawmakers representing New York City on the one hand and upstate and suburban districts on the other. On a few of the governor’s topline agenda items -- congestion pricing, recreational marijuana legalization, criminal justice reforms, and a property tax cap -- that divide has seemed most apparent this year, at times apparently stoked by Cuomo himself, and the governor has sought to leverage the budget deadline to push for their passage. Notably, he has said he’s willing to allow a late budget to accomplish his goals, which would mean that legislators could lose out on pay raises that are contingent on the budget passing on time, giving the governor additional leverage over the process. While Cuomo has said he finds himself “liberated” by full Democratic control of the state Legislature and the ability to pass legislation that stalled for years, he’s also been overtly antagonistic to his colleagues in the Legislature, particularly in the state Senate, for what he says is them failing to grasp the necessities of governing, sabotaging the deal to bring an Amazon campus to Queens, and hesitating to follow through on several policies that Republicans opposed for years. Senate Majority Leader Andrea Stewart-Cousins half-jokingly attributed it to “Senate Democratic derangement syndrome,” but many Democratic legislators have been taken aback by Cuomo’s approach, even if most have not been surprised. After an initial sprint of legislative activity that smacked of Democratic bonhomie, the Legislature slowed down as fault lines and a less rosy picture emerged amid negotiations over complex topics and some apparent backtracking. With news articles and political commentary pointing to the close bond between Heastie and Stewart-Cousins, and the power of the all-Democratic Legislature vis-a-vis the governor, Cuomo appeared to seek to increase his leverage, by having certain Democratic candidates sign policy pledges during last year’s campaign, setting out his “first 100 days” agenda in December, casting blame on Long Island Democrats for not doing enough to keep the Amazon deal on track, and more. It may all, or mostly, work out for Cuomo by the April 1 budget deadline, a major test for all the parties involved, but certainly an opportunity for Cuomo to both deliver on progressive promises and still show he’s in charge. Overwhelmingly reelected for a third term in November, Cuomo was emboldened and quick to show how he would approach the newly elected Senate Democratic majority. He rallied with newly elected and returning members of the state Senate on Long Island shortly after the election, pledging to ensure that New York City pays its “fair share” of funding for the Metropolitan Transportation Authority (MTA) even as legislators within the city were hammering him for starving the agency of funding, meddling with its affairs, and letting the city’s subways slide into chaos. Cuomo pitched congestion pricing as the chief remedy to MTA problems, insisting it must be done in the budget but offering few details of how it would be implemented. For lawmakers in suburban areas outside New York City and even for those in the outer boroughs, it proved divisive and it appears that any proposal that will be included in the budget will include several key carve-outs and funding set asides for the Long Island Rail Road and the Metro North Railroad. The governor has also called for making it state law that the city and state must split 50-50 any MTA capital plan shortfall not covered by dedicating funding streams like that from congestion pricing. 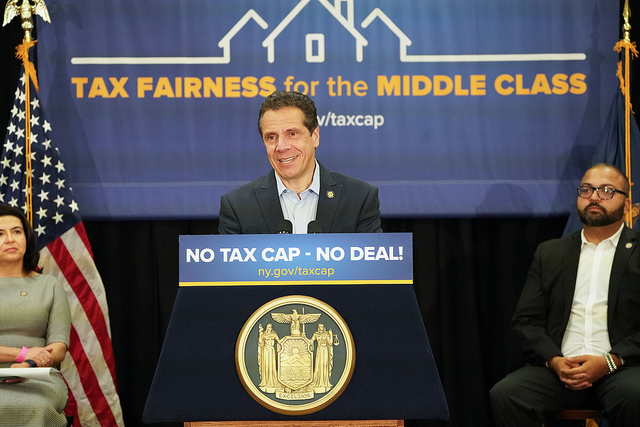 Cuomo has also launched a campaign to make the state’s 2 percent cap on annual property tax increases permanent, which is currently in place everywhere outside New York City. The cap has been a crowning Cuomo achievement, winning praise from members of both political parties, and renewed multiple times. He’s rallied on Long Island three times in two weeks to push for it and has said he will not sign a spending plan without it, even saying that he’s willing to let the budget be late. Even the governor’s proposal to legalize recreational marijuana seemed destined to create divisions along regional lines. It gave counties the ability to opt out of allowing sales, and several county executives -- including both on Long Island -- have already expressed intent to do so (something Cuomo said was not helpful in getting legalization passed in Albany). Meanwhile in New York City, which accounts for about a third of all regular marijuana users in the state and would make up an overwhelming part of any legal market, Mayor Bill de Blasio has already taken steps to reduce enforcement and has embraced legalization. Criminal justice reform, including banning cash bail and instituting speedy trial and open discovery reform, may be one of the governor’s remaining priorities that does not necessarily have a substantial budget impact. But Cuomo has nonetheless insisted it must pass with the budget -- citing it as an important decision deadline -- despite various concerns being raised by district attorneys and lawmakers from more conservative districts outside the city, and by more progressive lawmakers and advocate who have certain prerequisites for new pretrial incarercation rules. On issues like marijuana legalization and the broader criminal justice reform package, Heastie and Stewart-Cousins have not said anything is off the table; rather, they have indicated that both can be successfully approved after the budget and need not be rushed through by April 1. But the budget is where the governor enjoys maximum leverage and he has said that lawmakers can assign him the blame for passing controversial bills because there is no guarantee they will follow through in the post-budget session. 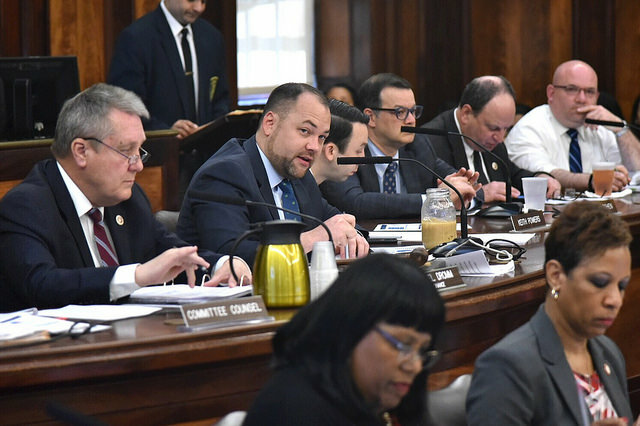 This May, Mayor Bill de Blasio and City Council Speaker Corey Johnson announced an advisory commission to recommend reforms to New York City’s property tax system. According to its website, the commission is charged with “developing proposals to make the system simpler, clearer, and fairer.” However, it has also been given the mandate to do so in a way that is revenue neutral -- a goal that is both counterproductive and unnecessary. For eight years, I had the good fortune to serve as the Press Secretary for the New York City Department of Finance. Every year, between September and February, I would meet at least weekly with the team of senior assessors to try to understand how the market had changed over the past year, what new rules and laws had taken effect, what changes we were making internally, and how all of this would impact property owners. For every change made, some property owners benefitted and others did not. “Revenue neutral” is a political term that implies that when the City makes a change to the system, it’s not being done to raise your property tax bill, even though it might. If it is unfair now, and the system is changed to be more equitable, virtually everyone will either have to pay more or pay less. When the impact is not neutral for anyone at the end of the day, saying it is just obscures the administration's stated intention that the City does not end up with less money to spend come budget season. The commission will make its job a great deal easier if it does away with this artificial constraint. Without giving due consideration to the revenue side of reform, commissioners would be free to think about the issues that would result in real equity among property owners. They could explore the option of including owner-occupied co-ops and condos in Class 1 (along with 1-, 2-, and 3-family homes) and valuing them based on their sales price, where most experts have agreed they belong for the past 25 years, without worrying that the change would bankrupt the City. They could even consider more progressive ideas, like valuing investor-owned residential properties as the income producing properties they are. For people who buy a home to live in, the value is in the sale price of their property. For people who buy a home to use as a rental or an Airbnb, the value is in income-producing capacity of the property. Because investors can capitalize on both, the revenue flows and the appreciation of a property’s market value, they are frequently willing to pay more than the average homebuyer. This, in turn, drives up market values in neighborhoods and makes it more difficult for current residents to buy a home. Owning a home is the greatest wealth-building opportunity that residents in this country have, and we should make sure our system does not inadvertently inhibit the ability of New Yorkers to own their home just because they would use it differently from an investor. Without the revenue neutral constraint, the Commission could also give real consideration to reforming the State-mandated tax caps that have created disparities between rich and poor neighborhoods, which are currently the basis for a lawsuit claiming the system is biased against low-income residents and people of color. These are not the only ideas out there for making the system fair, and the Mayor and the City Council should be commended for creating a commission and for holding public hearings to gather New York City’s collective wisdom to consider for their final proposal. However, neither these, nor any other changes can be seriously considered through a revenue neutral lens. That is not to say that the City cannot implement a revenue neutral change to the property tax, however. Assessments are only one input into a property tax bill, and the City’s goal should be to make sure that those assessments are accurate and fair. The other major input into this equation is the tax rate, which can be raised or lowered by the Mayor and City Council as they see fit during the annual budget process. If the Mayor and City Council are serious about holding the line on property tax revenue, they already hold that power. No commission necessary. 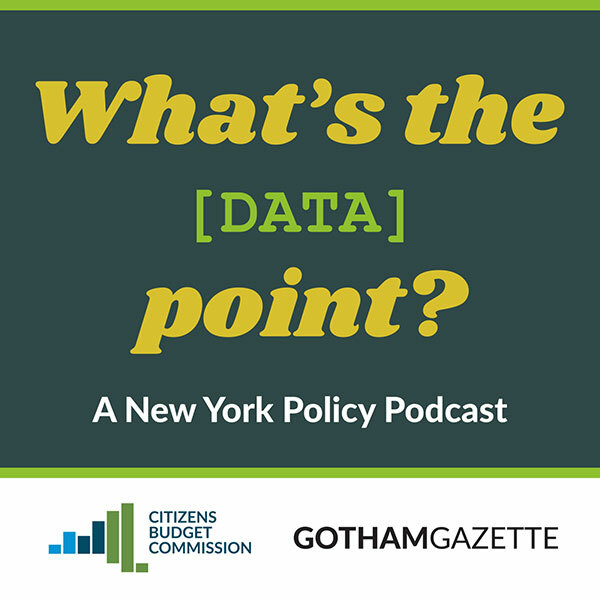 Owen Stone is a government performance and innovation expert who served at the New York City Department of Finance from 2006 to 2014. On Twitter @owenstone.